Izbat at Tabib, a small town of approximately 300 people located in the northwest of the West Bank, has 33 houses with demolition orders pending. The town totals 45 houses, this means that the demolition orders could destroy over 73% the town. According to a local witness, the majority of the demolition orders have been standing since 2012, in recent years at least two houses have been demolished in this small town. The first demolition took place in 2009, five years after the demolition order was served. The second house was demolished in 2011; just one year after the demolition order was handed to the family. In both cases the Israeli army gave the families only one hour to gather their belongings before their houses were demolished. Furthermore, there is Alfe Menashe, an illegal Israeli settlement located just two kilometres away from Izbat at Tabib. The growth and proximity of this illegal settlement is forcing the local Palestinian population to abandon their agricultural land. The villagers recall that the illegal settlers are planning to build a factory near Alfe Menashe, which could end up taking over 160 dunums (16 hectares) of land from Izbat at Tabib. An area of land adjacent to the town has had its trees uprooted by Israeli settlers recently. Allegedly this was done in order to clear the area for the future illegal factory. The villagers, however, have begun replanting the uprooted trees with young olive and pine trees. 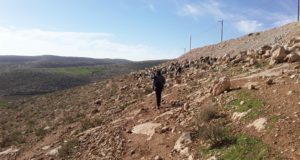 As ISM has extensively reported, the Israeli army has also been harassing the town of Izbat at Tabib, although witnesses recall that no major incidents have happened recently. Nonetheless, the Israeli army frequently goes into the small village at night, questioning local villagers and asking for their ID cards. 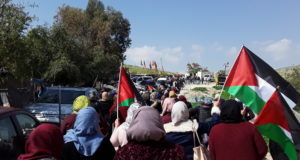 The Israeli army also frequently blocks the local road, which connects Izbat at Tabib with Road 55, forcing the locals to travel through the town of Azzun to reach their village. The last time this happened was approximately two months ago, although local villagers tend to remove the roadblock by their own means. The town of Izbat at Tabib is located in Area C [under full Israeli military control] according to the Oslo II Accord signed in 1995, therefore building or transit permits are very rarely granted to local Palestinians. 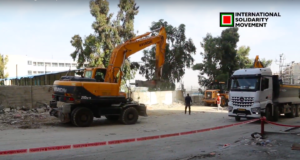 Since Israeli authorities do not recognise this town, they have placed almost three quarters of its structures under demolition orders, including the local school.